Don’t forget to drink lots of plain ol’ water! Forget about the “8 glasses of water a day” rule. Drink the equivalent of half your weight in ounces of water daily. 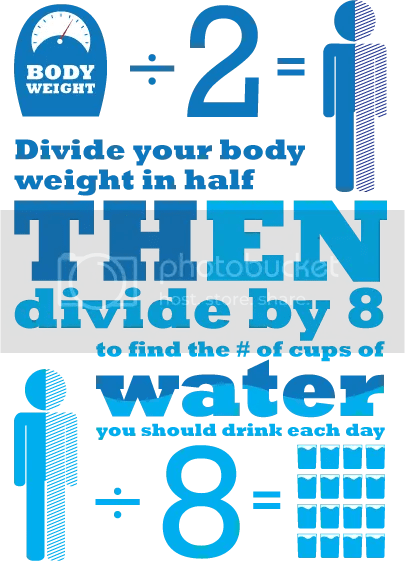 In other words, if you weigh 160 pounds, half that is 80 so you should be drinking 80 ounces of water daily. Eighty ounces is ten 8-ounce glasses. Anything less shortchanges your entire body of a vitally important nutrient. Furthermore, start each day by drinking a portion of your daily water allotment about 22 ounces first thing in the morning. You’ve just spent 7 or 8 hours sleeping, and during that time, breathing and perspiring have used a considerable amount of water. A cup of coffee may help you wake up, but it won’t do much to re-hydrate you. Drinking water first helps replace what was lost during sleep. And no, most beverages other than water don’t count. Caffeinated and carbonated drinks, for example, have a diuretic effect, irritating the bladder and creating the sensation of the need to urinate. On the other hand, fruits and vegetables are a water source wholeheartedly recommended. These foods contain high levels of water, along with plenty of valuable nutrients. Water makes your skin subtle and your muscles plump– and it is your best friend during a weight-loss regiment. Be sure to include lots of water this hot, hot summer as you progress through your weight loss journey. Do not wait to become thirsty before drinking water! If you’re feeling thirsty, you are already dehydrated. That is not a good thing, even if the weather is cool.